Viti (meaning ‘Hell’!) is an explosion crater on the northeast shore of Oskjuvatn. 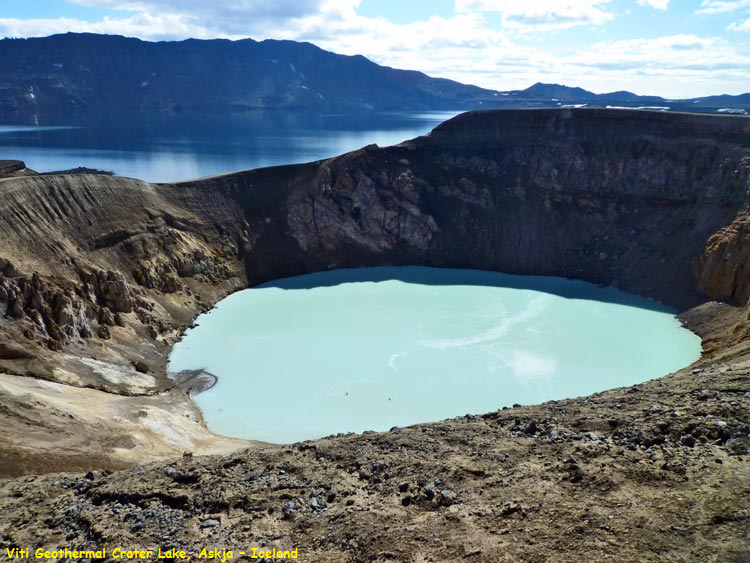 The Viti crater is around 150 meters in diameter and contains a geothermal lake of mineral-rich, sulphurous, opaque blue water.This is a good destination for a family excursion centering on a swim in the Viti crater. Having said that, the terrain you have to cross to get there can be hard going. There are sharp rocks, the trail can be slippery on the way down to the crater, and then there is the effort required to climb back out again. Given the remote location and the difficult climate, sometimes the only way to reach Öskjuvatn is on foot. Forewarned is forearmed, conditions in Iceland are often unpredictable. As a general rule, it is important to check weather forecasts before setting out, and to use a vehicle that is suitable for the highland roads. A four-wheel drive is a must.